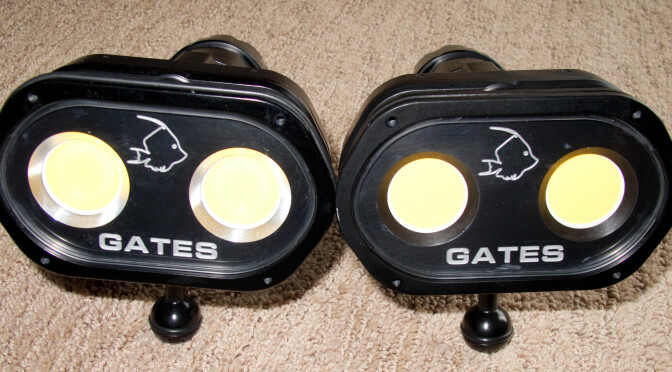 Review of Gates Underwater Products GT14 LED underwater video lights in green water. The GT 14 features (amongst a number of other features) a wide angle light angle and maximum light strength of 14000 lumen. The charger came with 4 charge green LEDs. They indicate 25, 50 75 and 100% charge. However Gates has indicated that they will most likely a different / better charger. The charging time of the batteries (Li-ion) is stated in the manual as 3 hours for 100% charge and 75 minutes for an 80% charge. Starting from a battery after burning it down to the flashing lights (2 minutes burn time left) it took 61 minutes to get to 75% and 180 minutes to get to 100% charge. During charging the actual charger gets warm but not hot. This is normal. burn time: > 10 hrs 75 min. 50 min. 40 min. 30 min. time: 16 hrs 69 min. 57 min. 52 min. 39 min. So in general the burning time meets or exceeds the manufacturers indication. I am convinced that the 69 minutes is simply a matter of the battery not the light. alternative mount by adapting the alternative mount to the 2 threaded holes (standard ¼ “ bolts). and not fall down. I “DIY-ed” a short sleeve over the battery part of the light. The weight of the light (with battery inserted) is 1417 grams or 3.14 Lbs. Once the floatation was in place the lights held in place without a problem. array constantly indicating strength and the other battery life. This would pose a problem with a “left and right hand light” and may not be practical. need the full capacity right away. higher intensity. I would have preferred a setting between 400 and 5600 but Gates will offer the option to program the lumen settings on a custom basis (at a cost) to meet your needs. This is a great option if you know you need specific light strength requirements. The light at any setting is nicely and evenly spread. The 90 degree angle gives a great spread and the light also allows an easy bridge for high contrast situations like for example when filming sand and rocks at the same time. light, the versatility of the light would be better. Subvision Production has a range of stock footage. Our focus is high-definition underwater stock footage. But we also offer above water stock footage. A growing choice of samples from our stock footage library can be found on our Youtube channel. You will find a range of subjects like jellyfish, kelp, rockfish, manta rays, giant pacific octopus and much more. The samples in our stock footage library are marked with a unique ID number and the description includes the format and other information. If you want we can time-code the samples and deliver them to you via Dropbox.